On February 28 we hosted our first ever PL12 event. 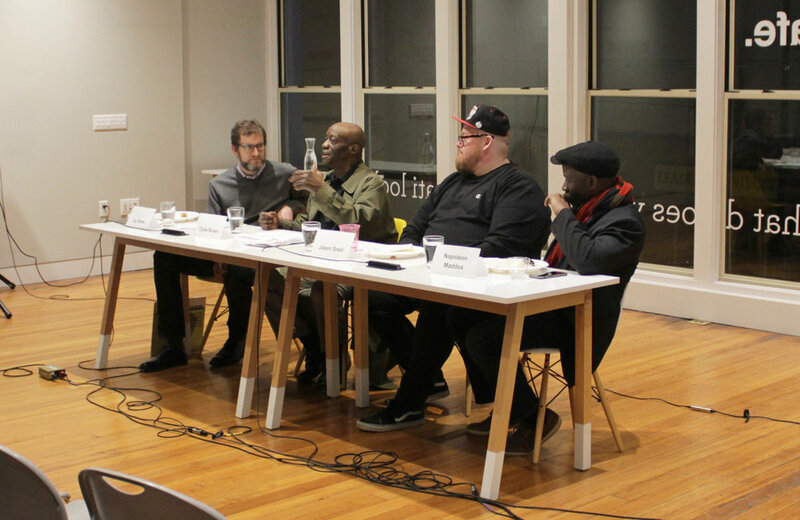 Project Grantees Yemi Oyediran, JP Leong, and Kayla Waldron, the team behind Queen City Kings, invited the public to People's Liberty for an insightful discussion about protest music and how certain songs can influence culture and vice versa. The event featured a panel hosted by Jay Stowe. Panelists included Clyde Brown from the legendary soul group The Drifters, Jason Snell of We Have Become Vikings, and Napoleon Maddox of isWhat?!. Music selections ranged from Sam Cooke to Kendrick Lamar. Overall, the evening was full of lively discussion and provocative ideas. What's in store for PL12 next month? Stay tuned.